Red is a very graceful and positive color. It is quite attractive and grabs the attention of people instantly as soon as they enter in a room. Designing a living room with red color is definitely a good idea as it makes the room look more alive and enhances the appearance of the room in a sportive way. Here are some red living room ideas to try and make your living area more remarkable and refreshing. The largest wall in the room where you usually put your television can be painted in red. It will make your room bigger and better. 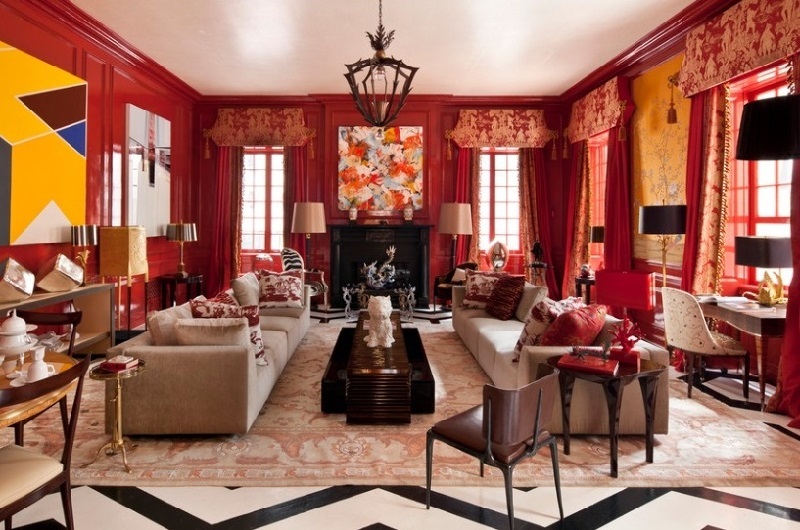 Red color will enhance the gracefulness of the living area and will add a red reflection to the room eventually. Red has many shades and a darker shade of red on your sofa will look simply gorgeous. You can combine with a lot of colors in your room and choose a dark red shade for the sofa set to make it stand out from the rest of the room. Red looks beautiful with most of the colors. Combine the shade of red as an embroidered cushion cover which is in cream color to make the cushions look royal and wonderful. Allow them to stay on the sofa in the living area and add to charm of the room simply and very easily. If there is any scope of cabinets in the living area, a dark red shade for cabinets goes great with woodwork. It makes the cabinet look extraordinary and different from the usual. The normal woodwork in brown is old school but with dark red cabinet, they look quite different and beautiful. Red looks very extravagant with white color. If a major part of the living area is white, then combining a carpet in red and white design will add a lot of color to the living room and make it look very gorgeous. If the living area has large windows, adding a few red colored curtains will make the room look quite enlarged and spacious. Curtains add royalty to any room they are put. Red is a royal color. A pale shade of red for curtains in velvet or satin will look extremely elegant and royal for a living area. Adding some accessorizing items in the living area which are red will also make the room red without actually doing a lot of efforts. Vases, flowers, show pieces, photo frames on the walls, centre pieces, and much more in red will add to the red color theme of the living area effortlessly. Red is an extremely powerful color and can do wonders to your living are if used in the right way. It can add color to the living area and also make it look more spacious than it usually is. It is a warm shade and looks beautiful always.